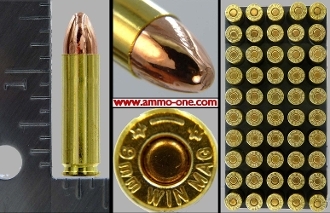 Our Products >> 9mm Win. Mag FMJ, Box of 50, Close out all sales final! Please Note: Box of 50 cartridges not a 20 cartridge box like many makers! Please Note: Single cartridges for collectors in related items below. History of the 9mm Winchester Magnum Cartridge: The 9mm Winchester Magnum, was made by Winchester in 1978 for the Wildey Firearm Company in 1978 for use in a special Wildey Semi-Auto Pistol. Thompson/Center also made for this caliber. To my knowledge, only Winchester produced this ammunition, but it has been obsolete for over 20 years until now in 2016. 9mm Win. Mag FMJ, Box of 50, Close out all sales final!